When I began this blog, I never wanted to climb on a soapbox and begin pontificating and boring you with my point of views. I wanted to make this a stroll down the well worn paths of our youth. However, I was recently forwarded some photos that I found so upsetting that I felt I had to let my feeling be known. I hope you’ll forgive this one transgression. However, once you view the photos that were graciously shared with us compliments of Mifflin Township Historical Society and Jim Hartman, you’ll understand. 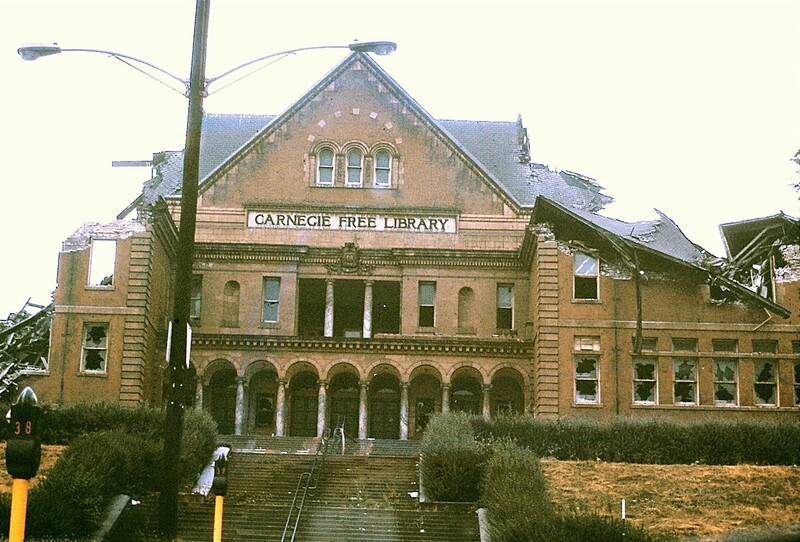 Despite Andrew Carnegie’s view that the community should support a library, three library gifts were given, without this requirement: Carnegie Library of Homestead, Homestead (actually Munhall, a few blocks from the Homestead Borough line), Pennsylvania (1898); Andrew Carnegie Free Library and Music Hall, Carnegie, Pennsylvania (1901); and the Carnegie Free Library of Duquesne, Duquesne, Pennsylvania (1904 to 1968). Each of these three libraries were endowed, as were two libraries prior to the establishment of The Carnegie Formula: Carnegie Library in Dunfermline, Scotland (1881) and the Carnegie Free Library of Braddock (1889). 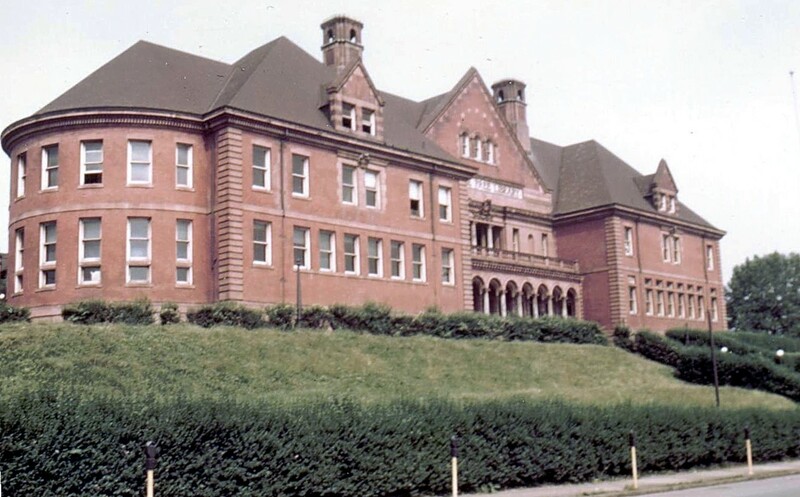 As in the case of the Braddock Carnegie Library, the libraries in Homestead and Duquesne were built to serve the employees of Carnegie Steel Company mills in those towns, and their faamilies. In the beginning, as was the case in Braddock, the company paid for the operation of the Carnegie Free Library of Duquesne. However, in 1901, Andrew Carnegie sold the Carnegie Steel Company for $480 million to J.P. Morgan, of New York City, and the United States Steel Corporation (for a time in the 1980s and 1990s known as “United States Steel Group,” a subsidiary of USX Corporation) was formed. At the conclusion of the sale, many of Andrew Carnegie’s business partners became instant millionaires. And, Andrew Carnegie, himself, became the richest man in the world!To take care of the libraries in the three Monongahela Valley towns, Andrew Carnegie set-up an endowment of one million dollars, to be shared among these three libraries. This endowment was managed by a Board comprised, primarily, of officials of the U.S. Steel Corporation. However, these officials were primarily interested in making money for the corporation, not operating three libraries. Consequently, the endowment for the three libraries was managed in a very conservative manner; to this day, officials of the Carnegie Library of Homestead are troubled that a hundred-plus year endowment did not grow as much as it could have.By the 1960s, the endowment was not enough to operate three libraries; so, it was decided to “sell-off” two of the libraries. 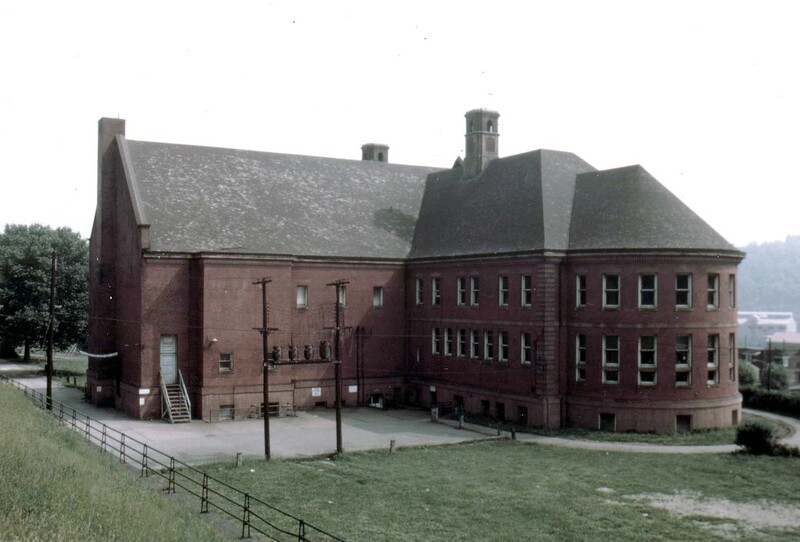 In the 1960s, the Braddock and Duquesne libraries were sold to the school districts in those towns, for one dollar each. The Braddock Carnegie Library stayed open for awhile, but was closed for much of the 1970s and 1980s due to the building’s dilapidated condition and lack of sufficient funding. A community effort reopened the library in the mid-1980s. 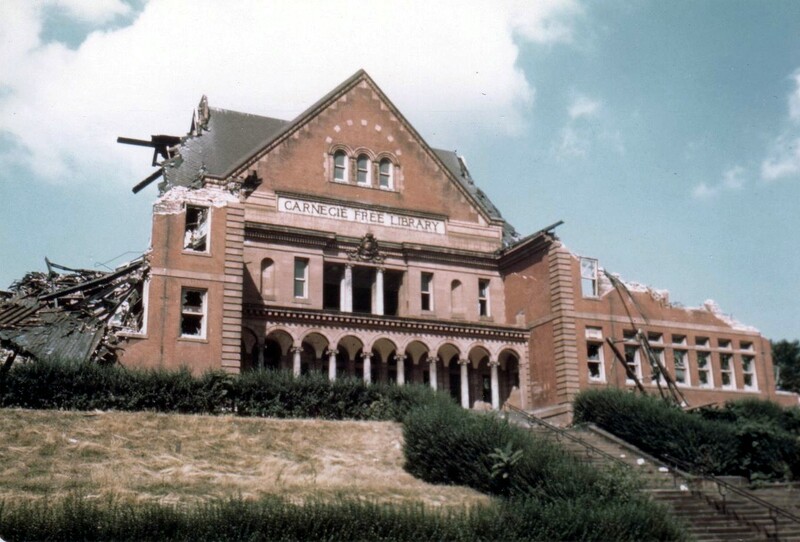 Although the Braddock Carnegie Library remains open (with a small two-day a week library branch operating in the Westinghouse Valley Services Center in Turtle Creek), they continue to have financial problems.Shortly after taking control of the Carnegie Free Library of Duquesne, the Duquesne City School District razed the structure, in June of 1968, to make-way for a school district annex (possibly a new gymnasium for the high school, located across the street). However, when the school district learned that the construction of such an annex would result in a partial loss of state funding, the project was quickly dropped. Thirteen 1970s-era split-level houses now occupy the former library property, a cul-de-sac named “Library Place.”It should be noted that the City of Duquesne is one of three Third Class Cities in Allegheny County (the other two being McKeesport and Clairton). In Allegheny County, all other municipalities are chartered as boroughs, townships (there are First Class Townships and Second Class Townships), or Home-Rule Municipalities. The only exceptions are the City of Pittsburgh which remains a Second Class City (although the original definition of a Second Class City meant a city of 500,000 population or greater) and the Town of McCandless. Allegheny City (now the North Side of Pittsburgh), where Andrew Carnegie built the nation’s first publicly-funded Carnegie Library (originally known as the Carnegie Free Library of Allegheny; now known as the Allegheny Regional Branch of The Carnegie Library of Pittsburgh) was also a Third Class City until, through political maneuvering in the Pennsylvania General Assembly by the City of Pittsburgh, in 1907 when the City of Allegheny was involuntarily annexed to the City of Pittsburgh. The fact that the City of Duquesne remains a Third Class City may be the reason their fairly small school district escaped the Commonwealth’s mandatory school district mergers in the late 1960s.Although the Braddock Carnegie Library is operating, once again, since this library was officially sold-off by the Board of the Endowment for the Monongahela Valley libraries, the Carnegie Library of Homestead is the only library that now has legal claim to this Endowment, the current value of which is approximately $1.8 million.And, a few years ago, the Carnegie Free Library of McKeesport opened a small four afternoons-per-week library branch in the City of Duquesne (which is located across the Monongahela River from McKeesport). This small branch library is located in the Duquesne High School, which apparently is slated to close after the current school year ends. The future of this Duquesne branch library is unknown. I find it unconscionable that the destruction of Duquesne’s Library senselessly occurred. I believe that the death of the Carnegie was the straw that broke the camel’s back and took the spirit out of the residents that had remained in Duquesne. Duquesne City School District was ranked 105th out of 105 Western Pennsylvania School Districts in 2009 by the Pittsburgh Business Times. The ranking was based on three years of student academic performance on the PSSAs for: math, reading, writing and one year of science. In 2008 the school ranked 105th of the Western Pennsylvania school districts and 496th out of 498 Pennsylvania school districts. The eighth grade ranked 141st out of 141 western Pennsylvania eighth grades, by the Pittsburgh Business Times in 2009, for academic achievement as reflected by three years of results on: math, reading, writing and one year of science PSSAs. The numbers almost defy believability. I think overdue children’s books were 1¢ per day and books from the adult section were either 2¢ or 3¢ per day. The orientation that the librarian gave when our class joined the library, explaining the card file and the Dewey Decimal System. This entry was posted in Duquesne Carnegie Library, Playing and Games, Sports. Bookmark the permalink. Was looking at a house in Duquesne thinking it would be walking distance to the library. What a disappointment that the library was demolished and thank you for the info & photos. It is an atrocity that the library was destroyed. I have one request, in about 1960/61 my parents signed me up for swim lessons. My grandparents had recently given me a garnet birthstone ring. I placed the ring in a sock then my shoe and left it in a locker as I went for a lesson. When I returned the ring had been stolen. I went to the library office regularly for weeks in the hopes someone had returned it. No such luck. If anyone knows about this incident and perhaps the whereabouts of the ring I’d really like to have it back…..no questions asked. Many people from the community need to step up and contribute to keeping our treasures from being torn down. Priorities need to be set on what is important in a community and what amenities it needs to stay a viable community. After our most recent renaissance of the Carnegie Library of Homestead, the whole of the community stepped up in a 60% plurality in a referendum to approve of a library tax which should assure it’s future for the next 50 years. The politicians of the three communities did not step up voluntarily but we’re forced by their citizens to adequately fund the Carnegie of Homestead. Rich, just came across this but I think you are referring to Dan Loya (I believe that’s the spelling) from St. Peter & Paul Church, corner of 1st Priscilla or Viola. From what I recall just about all of them followed in their fathers footsteps. Dennis, Yes, You are right on the spelling of the name. Once I left Holy Name, I never heard from them again. I think they had a quite large family. Dear Glenn: Superb job chronicling the “hit” that was done on the old Duquesne Library. I’ve been thinking about it since a piece recently appeared on how the Homestead Library (in Munhall) has survived with an intense, local effort made to keep the library a growing concern. The various reader responses ring true: The unique smell from the pool when you went down the stairs to the pool and the basketball courts; The high quality materials that were used to build the library; The gorgeous design of the library itself from the ground floor to the second floor and above. The glass floors in the stacks. A damned shame. I left town shortly after graduation from high school and was genuinely shocked when I saw the wreckage years later of the library. I know of 2 guys who were likely involved in the dirty dealing but won’t mention them here. I think they’re both dead now in any case. But such a dereliction of leadership. Are you related to Mike Dyakon? My aunt is in her 90’s…she used to date a Mike Dyakon. top floor of the 499 Bar on the corner of Pennsylvania and Taft Aves. I remember him….a really nice guy…always had a smile on his face. Laughing (but sad) as I read the comments … Kenny could drive on anyone and he did. I learned a lot of moves watching him. Dress requirements for playing basketball in the library..jock strap and gym shoes… the guys from the mill would leave them in a basket in the office. Mr. Cussick ( the ex postmaster of Duquesne)… he maintained the office. Don’t forget the gym was segrageted ..we had to open the side door and let Mike Daniels and other schoolmates come up the fire escape and slip in to play basketball. amenities, to some the “good old days ” but to others a sign of hate . Every time i read about the Library i remember going 8th period every day for band practice with Mr, Pelar. Since i graduated in ’68 i never had to practice anywhere else. Thanks for sharing everyone! Jim, thank you for posting this. Though I was raised in West Mifflin, this is the library we always came to. I learned how to swim here and watched my sister compete with the Duquesne Dolphins. I can vividly remember the interior of the locker room and of the interior of the library. Reading that article and seeing the pictures is so very sad. It was a crime when the school district tore down the library. Again another reason for not thinking of the education of our children. I grew up learning how to swim and play basketball at the library. Those were the days . If just 1 on the school board had the common sense to investigate and find out that the gym had to be part of the high school, maybe, just maybe, the library would still stand. Man, the games in the gym were learning experience. Nobody, I mean no one did layups at the rim without being chopped! LOL! Jim, as always thanks for the memories/pictures even when they aren’t always pleasant. Growing up in Duquesne I remeber the first time I was able to go in and use the library. I was totally in awe that I could get any of these books to read for free and was there quite often. The pool was a great place to go after Kennywood closed their pool for the season. My main recollection of the gym was that my uncle Ed Basista [Bake as many of the boys were called] coached and refereed basketball during the summer season. And try as he might [with help from many of the Dukes basketball players] could never get me to enjoy playing the game seriously no matter how much they tried. I was away in the Navy when the decision to tear it down was made and actually done. I was devastated to see the bulldozed lot during one of my passings thru Duquesne to visit with my parents. I feel that reading was always a means and measure of a persons success and achievement and always tried to instill a love of reading to my children and grandchildren. Libraries are a passing thing in the age of electronics but their printed works showed people so much. Duquesne Carnegie Library will always be missed by some of us. what is the name of your relatives in Bubnjarci ? My maternal grandfather was Nicholas Evanish, (in Croatian NICOLA IVANIS) and my maternal grandmother was Katherine Gorse ( in Croatian KATERINA GORSHE-BARSHE). They were both from Bubnjarci, but never knew each other there: he was several years older and travelled back and forth with HIS father to this country and stayed when his father returned to Croatia. He worked in a silver mine; she immigrated to Pueblo, CO to work for her uncle who owned a tavern. They married in 1911; by 1919 they had three children and were living in what is now Monroeville, PA, then to Turtle Creek. By the time the Library was torn down, I had moved from Duquesne/West Mifflin. My grandfather, whose family immigrated to “Germantown” in 1848, was devastated. The first time I returned to visit after the demolition, it was a visual and emotional shock that something as large and magnificent could be totally obliterated! And even today, each visit, I drive up Library Place and am overwhelmed by sadness with my memories of visits to the children’s room; visits that were filled with excitement and exploration into stories of wonder animals such as Black Beauty and Lassie, life on the prairie with the Little House books of Laura Ingalls Wilder, and mysteries solved by Trixie Belden. As I read about the dismal ranking of Duquesne students and what the town has become, I thought of a quote and philosophy I use in teaching Feng Shui. The first a quote by Winston Churchill “We shape our dwellings, and afterwards, our dwellings shape us” and from the teachings of Feng Shui, Our consciousness creates our environment; our environment reflects our consciousness. Our library was a symbol of knowledge and self-development; it encouraged physical health with its swimming pool and gymnasium and creativity with its stage and auditorium. 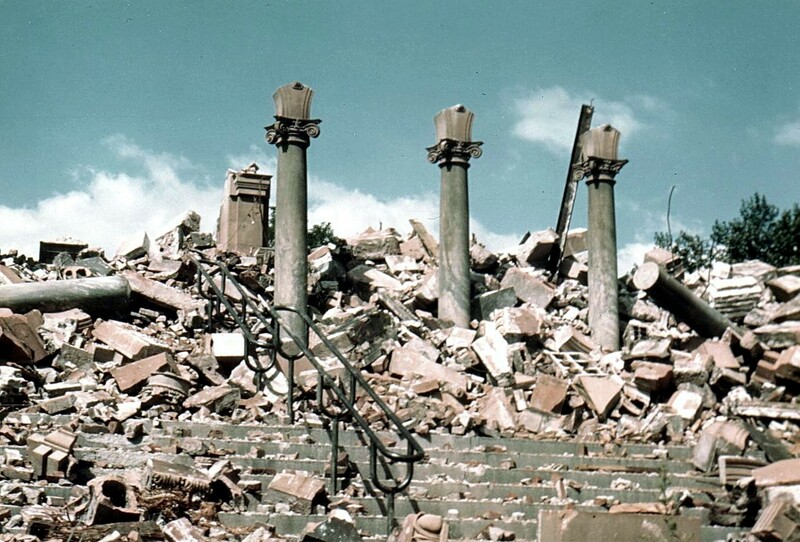 When that magnificent building was destroyed, the environment changed, the consciousness shifted. Which came first? My dad was in the Knight’s of Columbus and the passion play was held every year at the library. A few of my siblings as well as myself got to be in the play, I was the angel one year and will never forget the excitement of being on stage. Also, someone talked about the pool. This is where I learned how to swim, I believe Mr. and Mrs. Choate as well as Mr. Madeya were our instructors. Ahh, the smell of chlorine as you walked down the steps to the pool! Such memories, hard to see these pictures. should be standing today if proper mangement and “Greed” didn’t fall into place. Kenny, remember Chester Smith. No one wanted to drive to the hoop with Chester under the basket. John, You are right..Chester Smith was a Butcher !! What a crying out loud shame—-that—–that beautiful building is gone forever. I attended Holy Trinity School right above the library. Walked past it just about every day—–she was a beautiful place and a wonderful place. You are so correct about the rubber stamp and the reading room and the theatre. I have pictures of myself dancing and singing on that stage. I took dancing lessons from the McGuire Sisters who had their shop under Gallagher’s on Grant Avenue. How many times have you run up and down all of those steps???? Coming up the street in front of the library, how big and impressive of a building she WAS. What a shame and for no good reason. Here in Texas in a small no nothing town was a Carnegie Free Library. When I saw it—-well I had tears in my eyes, knowing ours was knocked down. Thanks for the wonderful memories and so sorry to hear Duquesne School System is so sorry also. Time, Life I guess it takes a toll on all of us. I agree with you 100%. I couldn’t believe it when they tore down the Library. Now the young people of Duquesne are barely literate. Sad.